Eat your veggies! But how do you make them taste satisfying and yummy so you want to eat them? And can it be easy? Yes, and yes! In my experience some of the tastiest food I’ve known comes from my Italian roots. Recipes that are founded in how my family cooks are simple, delicious, and some are surprisingly healthy! So much of Italian food starts with balancing a high quality olive oil with an acid (lemon juice or a vinegar), salt and pepper (often red pepper flakes, used more for flavor and a little zing if you want). Simple, I know! These building blocks of flavor can be all you need to make food delicious. Plus, it keeps the shopping list simple because these are ingredients that you can always have on hand, making it convenient to whip out roasted veggies at any time. 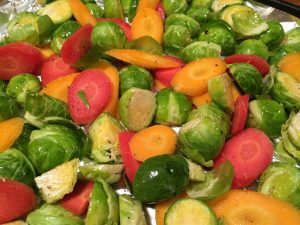 As your veggies roast, the outside of them will brown as their natural sugars and the olive oil caramelize, bringing out tremendous flavor. The salt will bake in, bringing out even more flavor, the red pepper provides flavor and a little zing if you add on the higher end, and the citrus will add another punch of flavor. 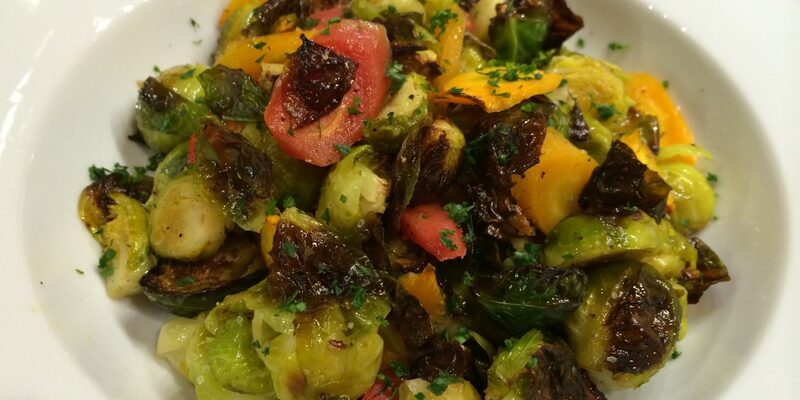 There’s so much flavor developed in the roasting process that you honestly don’t need the lemon juice to finish these amazing roasted carrots and Brussels sprouts. If you don’t have it, don’t stress. They will still be delicious. Remember, we are making it easier to eat our veggies! Clean and cut Brussels sprouts, removing stem, and outer leaves, then cutting in half, lengthwise. Soak and rinse in water. Wash, peel, and slice carrots, about 1/4" thick. Toss veggies in olive oil, salt, lemon juice, and red pepper flakes. Line a baking sheet with foil (for super easy clean up). Extra virgin olive oil has a smoke point of just over 400F, so if you plan to roast over 400F, I recommend using pure olive oil, avocado oil, or another oil that has a higher smoke point to roast. Then finish with a high quality olive oil for flavor when your veggies come out of the oven. Roast for about 30 minutes, or until tender and golden brown. Remove from oven and place in a bowl. Taste and adjust seasoning, adding a fresh squeeze of lemon juice, a pinch of salt, and/or a drizzle of extra virgin olive oil if needed. Season the same as above. For grilling I recommend using pure olive oil, avocado oil, or another oil that has a higher smoke point. Then finish with extra virgin olive oil for flavor when you take them off the heat. Put veggies in a grill basket. Grill until tender and golden brown, 20-25 minutes.